Keeps bait away from children and non-target animals. Unique patented, double-quartered locking barbs make Aegis tamper resistant. The clear lid, with a transparent panel in the cover, makes bait monitoring easy and efficient. Clear lid model allows technicians to quickly see snakes and insects that may be hiding in the station. Solid lids are available in the cool box (white) or the traditional (black). 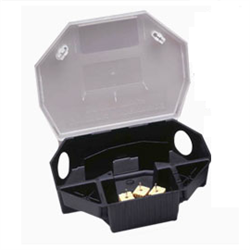 All stations contain bait trays making clean-out quick and easy. One universal key opens all Aegis products. No need for special tools or multiple keys. Vertical and horizontal baiting rods secure bait inside the station and away from moisture. Use indoors or outdoors in any type of environment (commercial, residential, industrial and agricultural). Anchoring slot to properly secure station.